This week, we’re looking to the west coast! If you’re living in Seattle or wishing you did, keep reading. Here’s how to live, work, and have fun in this exciting city. Who doesn’t need a little caffeine to wake up in the morning? At KM, we’re big fans of coffee and, luckily, the original Starbucks store is right at our doorstep. Just a four-minute drive from our office will get you your favorite mocha from the store that started it all! If you’re looking for something less mainstream, Uptown Espresso Belltown will offer you coffee with their unique velvet foam finish, as well as hand-made bakery treats. Seattle is home to some of the most beautiful scenery. Two of the city’s best parks are less than a ten-minute drive from our office; it’s easy to get some fresh air and take in the views during your break! Kerry Park offers an amazing perspective of the city and its iconic skyline. It has one of the best views of the Space Needle in the entire city. Or, enjoy some art while taking a stroll through Olympic Sculpture Park. This park is nine acres of art that lies near the water’s edge. Grab a colleague and explore places nearby for your lunch break. In the mood for Mexican? Cantina Lena is a one-minute walk away from our office. They’re known for serving must-try quesadillas, tacos, and margaritas. Or, satisfy your hunger at either Lola or Dahlia’s Lounge. The neighboring restaurants are staples in the Seattle area and require just a five-minute walk down the road. Happy hour, anyone? Seattle has its fair share of hip bars that are perfect for any group to relax after work. Having been established in 1910, the Queen City Grill is an iconic spot for great drinks and food. Also, nearby is the Southern-inspired bar named Branchwater. They’re known for their happy hour deals and their hospitality alike. And, if you’re dreaming of a beach vacation look no further than the Gold Bar. The Caribbean inspired drinks to await you and your co-workers at this hip cocktail bar. All are less than 5 minutes away by car from the KM office, so order a drink and enjoy your company. Island-hop your way through the weekend by taking advantage of the ferry station, which is only seven minutes from our office, in Seattle. Bainbridge Island is located in the Puget Sound and is just 35-minutes boat ride away from Seattle’s port. It is the perfect island to unwind after a long week and enjoy your days off work. There’s gardens, vineyards, hiking trails, and a nature reserve. Not to mention the view of three different mountain ranges and the skyline of Seattle in the distance. It’s so close to Seattle, yet feels like a completely different place altogether – it’s the perfect “stay-cation” for your weekend. 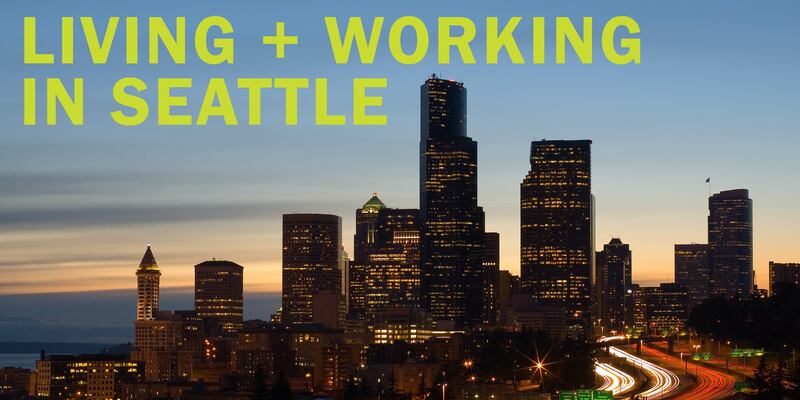 Interested in trying your hand at working, living and having fun in Seattle? KellyMitchell is hiring, check us out here!